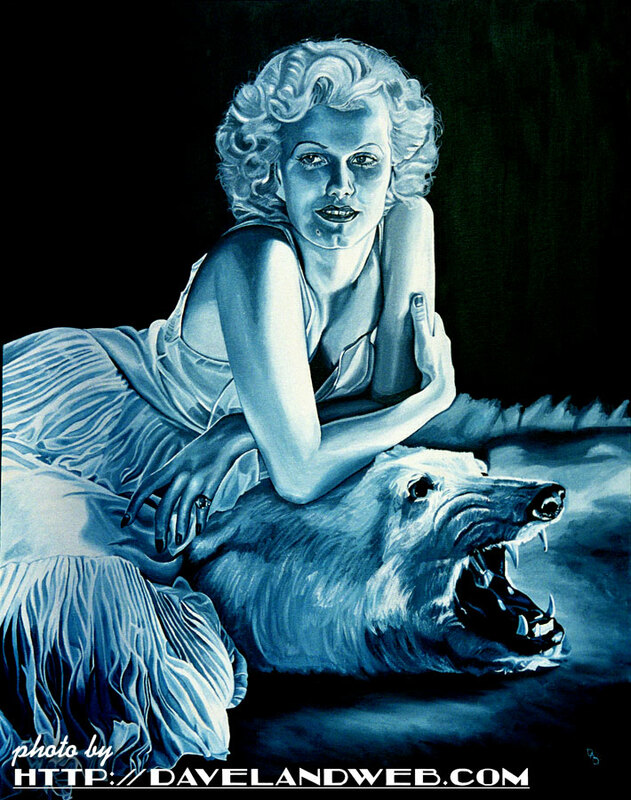 I was able to see this painting in person at the Santa Monica History Museum when it was put on display just before it was sold as part of the Love, Shirley Temple auction in 2015. 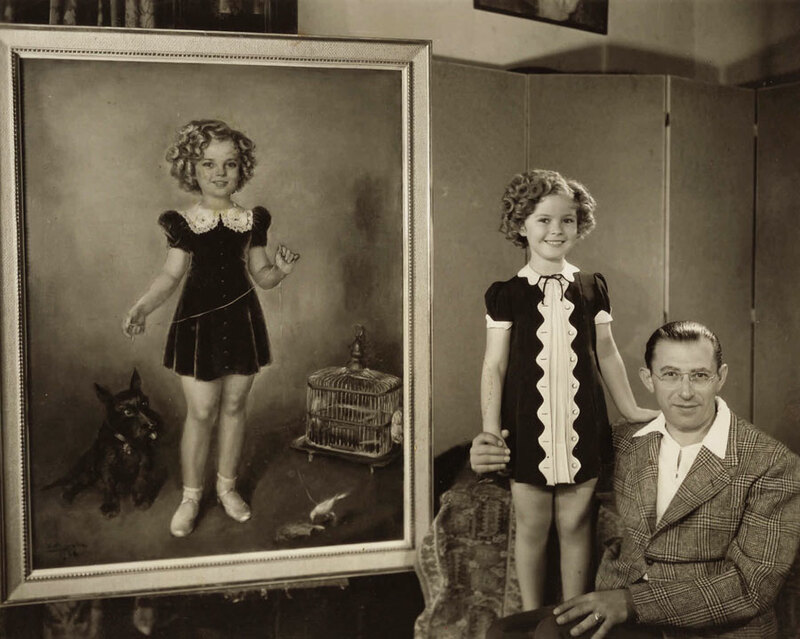 The Child Star is shown with her dog, Corky, and a canary in a cage in the oil painting that measured a large 58" x 46". 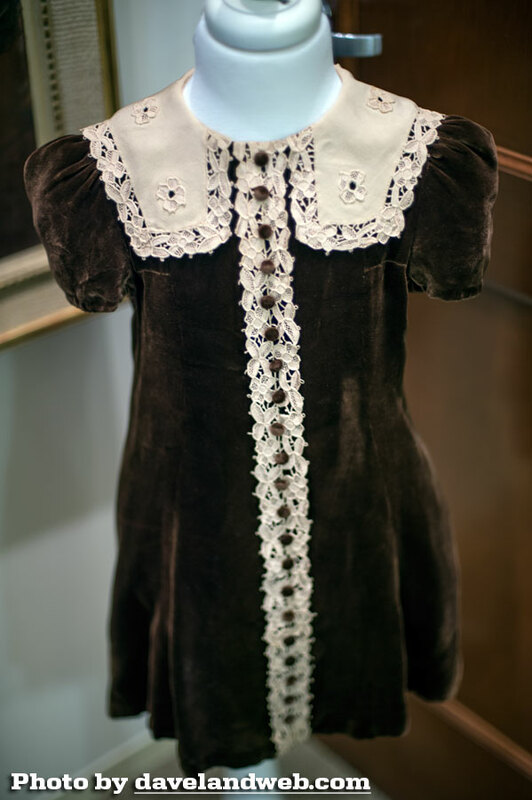 Her presence is signified by classic ringlet curls, smiling expression, and fingertip-length skirt hem. Her shoes are shown scuffed at the toes indicating their dancing purpose, and alongside sits her beloved Scottie named Corky and a bird cage whose canary resident is tethered on a leash. 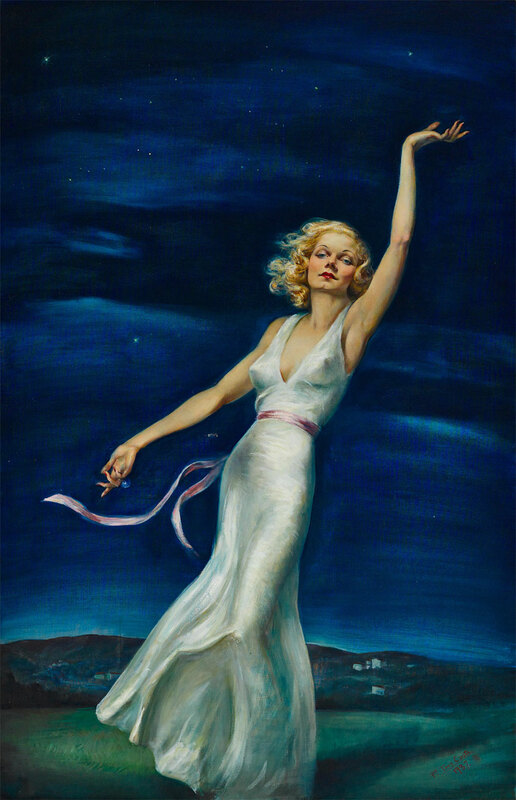 Signed in lower corner "P. Costa 1936".…Costa, the Russian-born portrait painter, immigrated to the United States in 1929 at the age of 38. He was commissioned for portraits of Presidents Hoover and FDR, as well as portraits of General MacArthur, the Prince of Wales, and King Christian of Denmark. 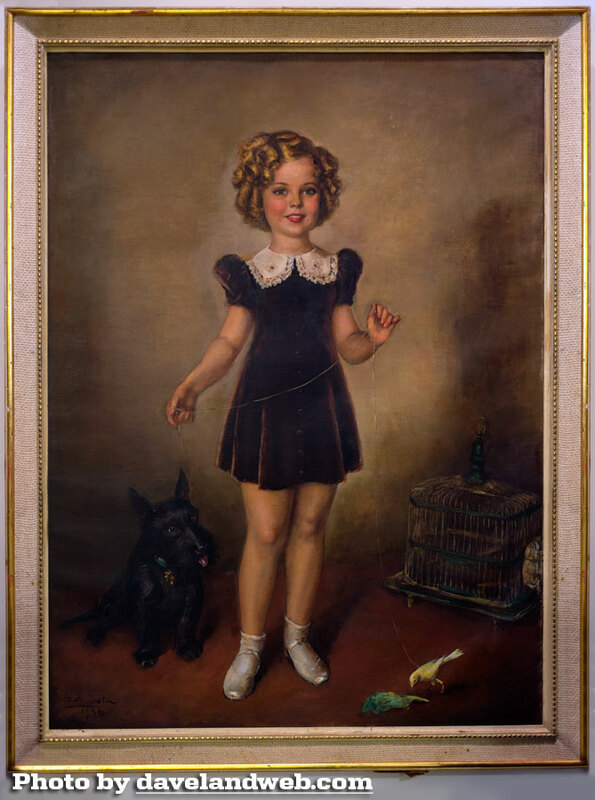 In 1935 he moved to California, and among his works during that era is this portrait of Shirley Temple. Presale estimate was $5000; the gavel went down at $23,000. 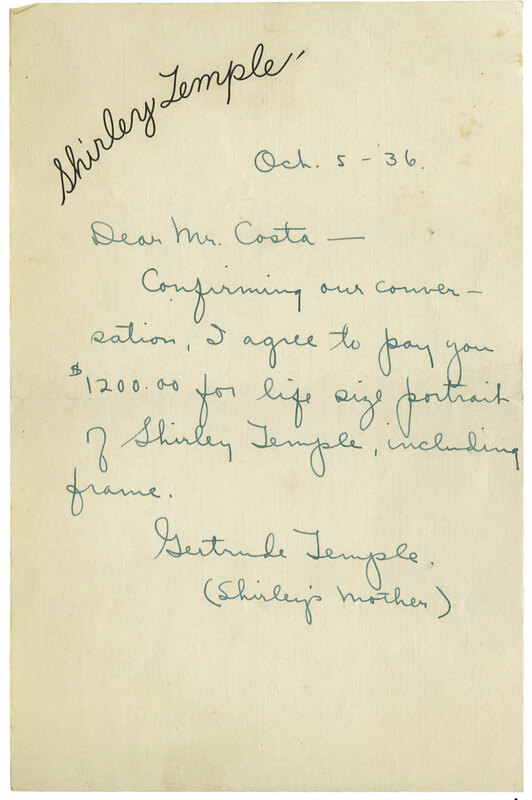 Gertrude Temple made a fairly good investment, but not stupendous. Lost for years, the piece was photographed in black and white in the 1930s, and that was all that existed of it until it resurfaced recently at a Bonham’s auction in November 2016. It has been inventoried in both the National Portrait Gallery and the New York Public Library's Prints and Photographs online catalogs. Here’s a youtube video that talks about the recovery of the painting. It was found in an abandoned home in Harrisonville, MO. A renowned chemist, Dr. James D. Idol, bequeathed his niece's his estate and they discovered this amongst the broken glass and animal poop almost 50 years later! All I can say is that it’s a miracle it has survived! 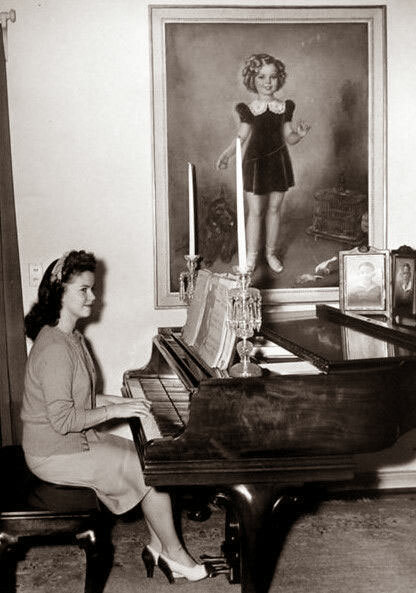 See more Shirley Temple photos at my main website.